How will autonomous vehicles (AV), specifically driverless cars, impact the future mobility and development of the Chicago region? In a program co-sponsored by the APA Illinois Chapter's Chicago Metro Section and AIA-Chicago Regional and Urban Design Community, a panel of experts in transportation, design, and planning considered the possibilities and engaged with an audience of planners, architects, and allied professionals. Moderator Mark de la Vergne, chief of mobility innovation at the City of Detroit Mayor's Office, presented innovative transportation initiatives from the Motor City. His work includes accelerating mobility as a service for all residents, integrating connected and autonomous vehicles as part of the transportation network, and developing sustainable funding mobility services. Jennifer Henaghan, APA's deputy research director and manager of the Green Communities Center, reviewed potential impacts of AV technology for cities and regions and discussed APA's current work on this issue (including an upcoming symposium, PAS Report, KnowledgeBase resource collection, and official APA policy statement). 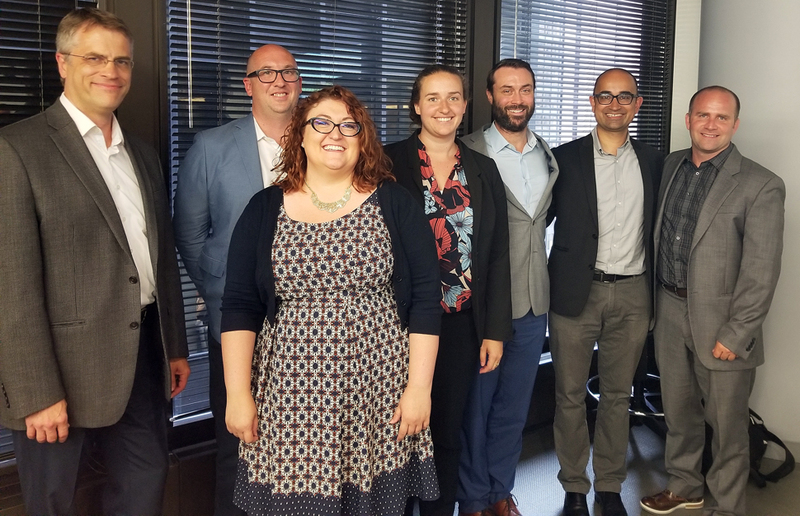 Elizabeth Irvin, associate planner at the Chicago Metropolitan Agency for Planning (CMAP), told the gathering how CMAP is incorporating AV into ON TO 2050, the Chicago region’s next long-range comprehensive plan. Session coordinators and presenters Steve Wilson, Mark de la Vergne, Jennifer Henaghan, Elizabeth Irvin, Joe Ioacabucci, Nilay Mistry, and Ezra Kramer. Photo by Kate Calabra. Shifting the discussion to transportation and parking systems, Joe Iacobucci, director of transit and new mobility practice leader at Sam Schwartz, explored the future of ride sharing and potential impacts for cities. Ezra Kramer, project manager at Walker Parking Consultants, shared ways in which changing parking demand will create new development opportunities. Nilay Mistry, part time professor at IIT, wrapped up the presentations with a summary of ongoing research from the Illinois Institute of Technology’s Driverless City Project. Audience members were very interested in the potential outcomes of AV, which were often presented as opposing possibilities in a "heaven or hell" scenario: dense, pedestrian-oriented urban centers versus endless sprawl, increased mobility versus isolated populations, etc. The main concern, however, seemed to be ensuring that, however AV is implemented, planners and other design professionals have a voice in crafting policies and regulations to ensure that deployment is consistent with and contributes to achieving our communities' goals. Top image: A Toyota Prius, modified by Google to include autonomous vehicle technology, drives a demonstration lap in California. Photo by Flickr user jurvetson (CC BY-NC-ND 2.0).